A series of high profile arrests were made when Mexborough saw a week of action against organised crime by our officers, writes Insp Adi Luscombe. The operation ran until Sunday March 10, and saw arrests, high visibility patrols on the streets and crime prevention work. Perhaps the most dramatic element of the week were warrants carried out by our tasking team, what is often called a police raid. On the Monday, officers arrested a man for attempted murder and attempted robbery, related to an incident which happened last month. 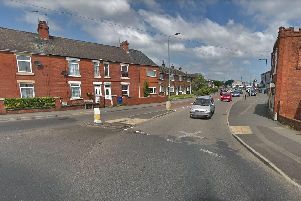 A gun was fired in the incident, which happened back on February 16 , at Welfare Avenue, Conisbrough. The arrest was made on Main Street Mexborough as part of the operation. In a separate case, the tasking team also arrested three people in Mexborough in a car which was stopped as part of the week of action. During the operation, we had number plate recognition cameras on the streets, run by our road policing group. They can notify us if a car has no insurance, or if there is in intelligence held on the vehicle. On Wednesday March 6, we picked up on a car, and it was stopped on Hartley Street, in Mexborough. Amphetamines and CS gas spray were found in the car. Three men were arrested and put under investigation, and as a result of those arrests, a house was raided in Mexborough. We found a electric shock stun gun and a quantity of heroin in the house. Those were the most dramatic aspects of the week. But there was other action. There were two drugs warrants carried out. One was on Windhill Crescent, where nothing was found. A second, on Simpson Place, resulted in a quantity of cannabis being discovered. During the week, there were over 30 people stopped and searched, and there were arrests made of people who were found to be driving under the influence of drink or drugs. There were also over a dozen knives handed in under a knives amnesty. Work on keeping knives off the streets continued the following week, as part of a separate force-wide operation, which also saw our officers going into school and warning of the dangers of knives. It was not only raids and arrests being carried out. There have been joint patrols between ourselves, Doncaster Council and South Yorkshire Fire Service. Elsewhere in Doncaster West, we have had two new PCs starting in the neighbourhood, as the number of PCs rises from six to eight. One will be dedicated to Edlington, and the other will be assigned to the north of the neighbourhood, looking after areas like Adwick, Bentley and Sprotbrough. I recently read figures in the Doncaster Free Press which ranked Sprotbrough as having the second worst vehicle crime figures in Doncaster. I think it is important to make it clear to people living there, that there is not an epidemic of car crime in their village. The ward of Sprotbrough is a big area, and it extends to the A1(M), and includes the busy Barnsley Road. In terms of crime on vehicles on people’s driveways on Sprotbrough’s estates, the figure is pretty low. Most of the vehicle crime in the area involves cars and lorries left overnight in lay-bys, involving offences like theft of fuel and number plates. It is something we’re looking to tackle. Finally, as the weather gets warmer, we are starting to see off-road motorbikes become a big source of anti-social behaviour. This is clearly an issue that matters to the public. We are running patrols and have have used the forces’ specialist team, which use our own off road bikes to catch those who are causing a nuisance. We are planning more operations like this in the future. Over a three week period, we have seen nine off road bikes confiscated, from places including Steetley Quarry, near Conisorough, Gordon Road, Edlington, Ellershaw Road, Conisbrough, and Woodlands. We will keep a close eye on this issue as we approach spring and summer.